Description of "Dhatupatha Verbs in 5 Lakaras Vol2"
This book is a seminal work on the Dhatupatha of Panini, Roots of the Sanskrit Language. It contains Sanskrit text and English commentary. It includes Accents and Meanings for each Root. Verbs are the backbone of any sentence. How may one write or understand a Sanskrit sentence without knowing the exact spelling of Verbs? This was our motive when we began writing this book. 1. Verb Conjugation Tables are given for the 5 Lakaras that are prominent in literature and are in daily use in the Modern context. Lat Present Tense, LRt Future Tense, Lot Imperative Mood, Lang Past Tense, VidhiLing Potential Mood. Relevant Ashtadhyayi Sutra is indicated whenever a Dhatu is complex to conjugate. For Ubhayepadi Dhatus, both Parasmaipada and Atmanepada forms are listed. 2. Additionally the Reader is introduced to the Lat Passive Voice forms for each Root. 3. Nishtha Participles are also given as it is a kRt affix, to make the book useful and complete. The work is in 3 Volumes, with Roots listed in the correct Panini order. The person (third person HE, second person YOU, etc.) and number (singular ONE APPLE, plural THREE APPLES, etc.) that are commonly used in English Grammar for sentence syntax, structure and meaning are Conjugated in Sanskrit within the Verb itself. This means that the person (SHE, IT, etc.) and number (BOTH ITEMS, MANY ITEMS, etc.) are not separate words in a Sanskrit sentence. The Verb in a Sanskrit sentence contains such information intrinsically. This is done by taking a Verb Stem and applying suffixes to it in a matrix of 3x3. The correct spelling for each Verb in 3 persons and numbers makes it a highly useful Edition for Grammar Schools and Vedanta Gurukuls. 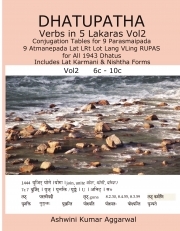 Reviews of "Dhatupatha Verbs in 5 Lakaras Vol2"